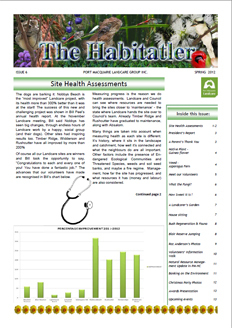 Habitatler Issue 8, Jun 2013. 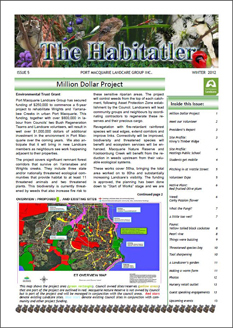 Habitatler Issue 7, Feb 2013. Habitatler Issue 6, Spring 2012. Port Macquarie Landcare Group has secured funding of $250,000 to commence a 6-year project to rehabilitate Wrights and Yarrana-bee Creeks in urban Port Macquarie. This funding, together with over $800,000 in la-bour from Councils� two Bush Regeneration Teams and Landcare volunteers, will result in well over $1,000,000 dollars of additional investment in the environment in Port Mac-quarie over the coming years. We also an-ticipate that it will bring in new Landcare members as neighbours see work happening adjacent to their properties. The project covers significant remnant forest corridors that survive on Yarranabee and Wrights creeks. They include three state and/or nationally threatened ecological com-munities that provide habitat to at least 11 threatened animals and two threatened plants. This biodiversity is currently threat-ened by weeds that also increase fire risk to these sensitive riparian areas. The project will control weeds from the top of each catch-ment, following Asset Protection Zone estab-lishment by the Council. Landcarers will lead community groups and neighbours by coordi-nating contractors to regenerate these re-serves and their precious cargo. Revegetation with fire-retardant rainforest species will seal edges, extend corridors and improve links. Connectivity will be improved, biodiversity and threatened species will benefit and ecosystem services will be en-hanced. Macquarie Nature Reserve and Kooloonbung Creek will benefit from the re-duction in weeds upstream from their valu-able ecological systems. 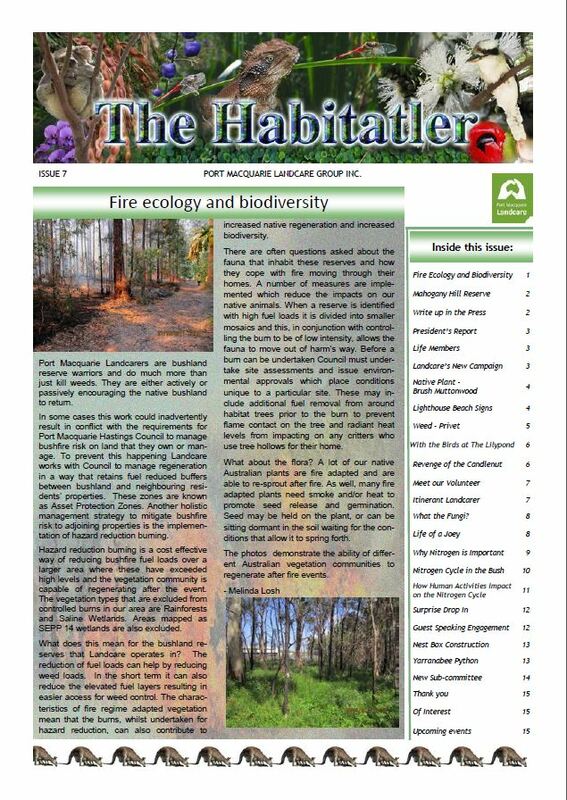 Habitatler Issue 5, Winter 2012. Port Macquarie Landcare volunteers gathered in large numbers with excitement on the Town Green on Wednesday 04 April 2012 for a very special occasion. 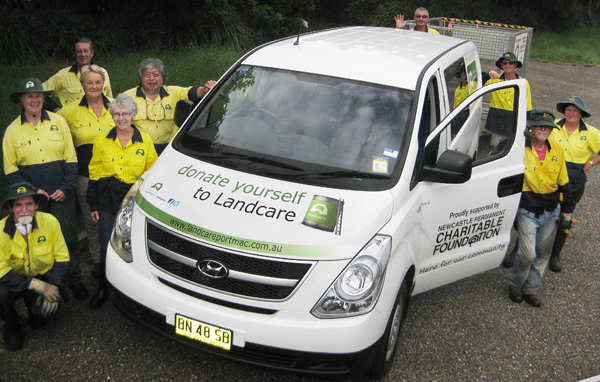 Newcastle Permanent Charitable Foundation has enabled the Landcare Group to purchase and fit out a new vehicle to transport plants, water, tools, equipment, signs, furniture and volunteers to projects and working bees throughout the Hastings area. Last year Port Macquarie Landcare volunteers travelled more than 14,000km in their own cars working on various projects. The new van means that volunteers will no longer have to use their own cars to transport heavy plants and tools, which has also become a safety issue. The formalities were followed by informal light refreshments which provided a great opportunity for the Landcare volunteers to mingle with the representatives from our local based Newcastle Permanent Building Society and the representatives of the Newcastle Permanent Charitable Foundation. 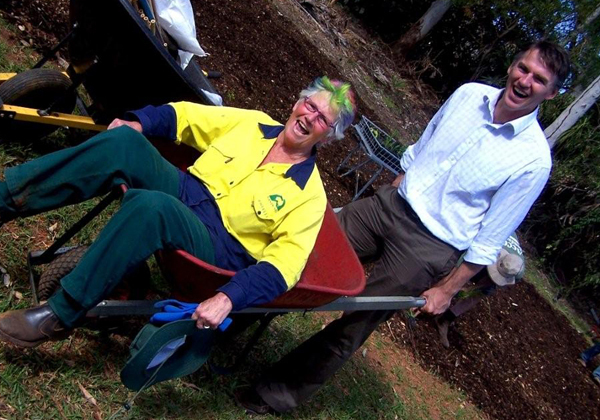 Many Port Macquarie residents may be appreciative of the marvellous work being done by Landcare volunteers in their neighbourhood reserves or at the nearby beaches, but never had the opportunity to pass on their gratitude. Now is their chance to say thank you to the volunteers, and at the same time fund some equipment for the ongoing maintenance at the numerous project sites around Port Macquarie. 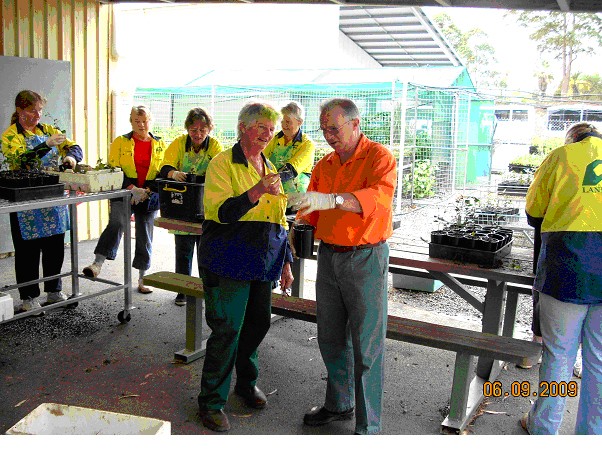 Project managers often have to apply for government or corporate grants to fund the clothing and equipment required for volunteers to perform their weeding and tree planting tasks each week. 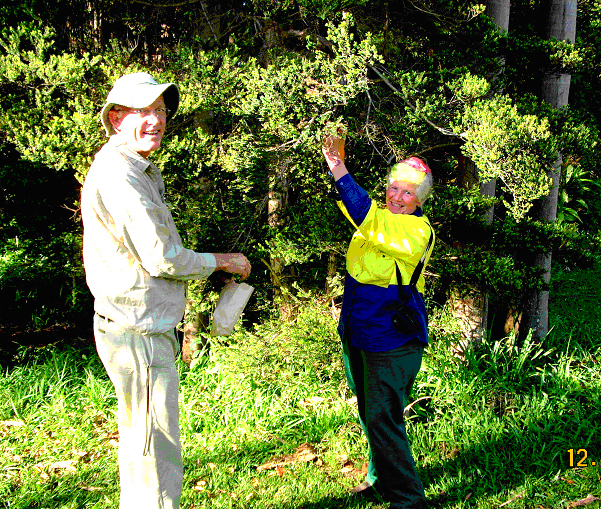 Volunteers weeding bushland areas need tools, chemicals and protective clothing; others need gumboots and waders to access boggy swamplands. Tools for all projects need to be purchased periodically and maintained regularly. Tuesday 12th October 2010 will see Port Macquarie Landcare�s inaugural fundraising luncheon being held at the Sea Acres Rainforest caf� from 11.30am. Tickets are only $35 and numbers are limited, so bookings are essential on 6582 4444. Included is a 2 course lunch with a glass of locally grown wine, and tea or coffee. 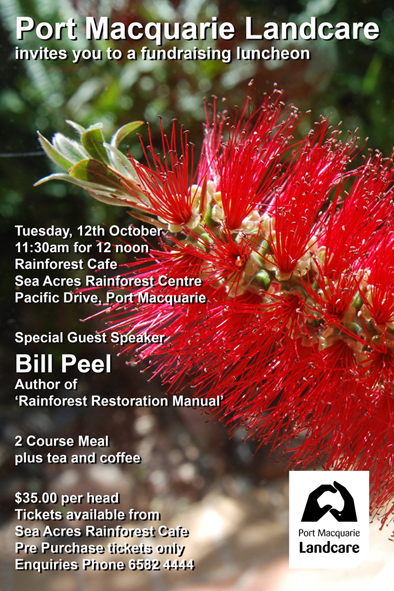 The special guest speaker is Bill Peel � Port Macquarie Hastings Council ecologist and author of the CSIRO�s �Rainforest Restoration Manual�. There will be autographed copies of his rainforest book for sale on the day too. 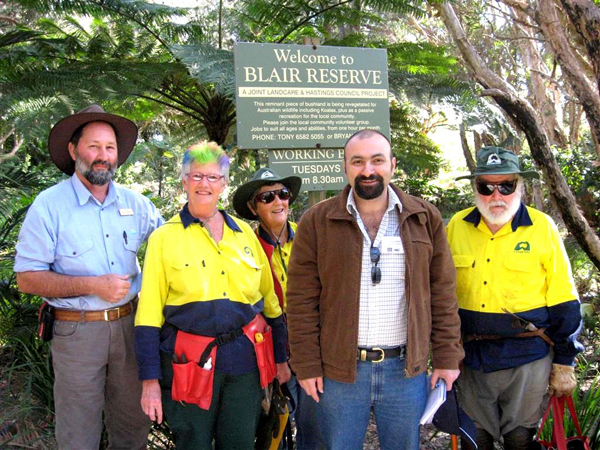 Landcare�s Blair St project manager and local entertainer Tony Bischoff will be performing his new �Landcare� song (written especially for this occasion). There will also be an auction of �environmentally friendly� products � everything from potting mix and native plants, to nature books and annual passes for Sea Acres. Where the Wild Taro Grows... You will find a dedicated band of Landcarers (the Swamp Rats), hand-removing Taro Colocasia esculenta which is an invasive troublemaker in the gaps of our local damaged Swamp Sclerophyll Forest. Taro is a fast growing aquatic weed with dark reddish purple stalks and very large, arrowhead-shaped dark green, velvety leaves (somewhat like elephant�s ears), hence it�s oft-used common name. In some parts of the world taro is harvested for the potato like tubers: �esculenta� means edible. The plant is actually poisonous if eaten raw due to raphides (needle-shaped crystals in the plant�s cells) which leads to severe stomach ache. So why is this native of the Pacific islands here and, more importantly: why is it in OUR swamp? Well....it was the last fad in gardening: but Taro�s popularity has since worn off and some took the cheap option of dumping this weed out into the nearest waterway (our swamp). Wild Taro pollutes water by trapping organic matter in its roots, producing foul smelling sediment. Disturbed plants can release toxins harmful to wildlife and rapidly out-competes natives. We have found no evidence of wildlife using the Wild Taro patches as habitat; which may be due to these toxins. It has the ability to destroy the canopy of the forest and in so doing creates more gaps which are its preferred habitat. The Landcare Community Nursery monitored a range of methods of chemical control (none of which were successful and/or safe near waterways). So it comes down to hand removal being the most effective method. This is a lot of hard work and fun (see the results with our before and after photos and us in our best Personal Protective Equipment of Gumboots and Waders) . Most of our work has been done in Rushcutter Creek where it crosses Cathie Rd (at Lighthouse Beach). The area upstream of the road was full of Taro and now the native reeds and sedges have come back: much better for our local frogs and fish. The Taro is growing in amongst the threatened tree Biconvex Paperbark Melaleuca biconvexa which has become vulnerable to these weeds in its only home in Port Macquarie: a plant community called �Swamp Sclerophyll Forest�. Even its own plant community is threatened by land clearing and changes to the water flow on the site. We are lucky in Port Macquarie in that we have some very significant stands of this species. This is one of the few areas where it sets viable seed (that germinates). Only found in New South Wales, it grows in damp places from Jervis Bay in the south to the Northern Rivers. The white flowers burst forth in just a 3-4 week period between September and October (and then not every year). Biconvex Paperbark is a beautiful small tree, usually up to 10 m tall, though occasionally as high as 20 m. The placement of the leaves is very distinctive, with each pair of leaves emerging at right angles from the branch. Each pair is offset at right angles to the previous pair so the branch has a squarish appearance when looked at 'end-on'. There are stunning photos on our website of one of our rescued trees in full flower taken at Rushcutters Way this month. The flowering this year has been prolific following the dedicated weeding work of our Landcare and Conservation Volunteers. The other plants in this Swamp Sclerophyll Forest are Prickly Paperbark Melaleuca styphelioides (that wears a crown of beautiful fern and orchid epiphytes), Broadleaf paperbark M. Quinquenervia (nectar for the birds), Cunjevoi Alocasia brisbanensis (the frogs love these), Creek Sandpaper fig, Ficus coronata and Small leaved fig Ficus obliqua (fruit for the birds). These are planted to close the damaged gaps and thereby rob the Taro of its favoured habitat so that in time it will be more difficult to invade again in the future. The Landcare volunteers would like to thank all the local residents who keep an eye on our good work helping to protect it from vandals as well as all those lovely people who stop to let us know how much they appreciate what we are doing. We are the recently formed �Green Fingers� team. 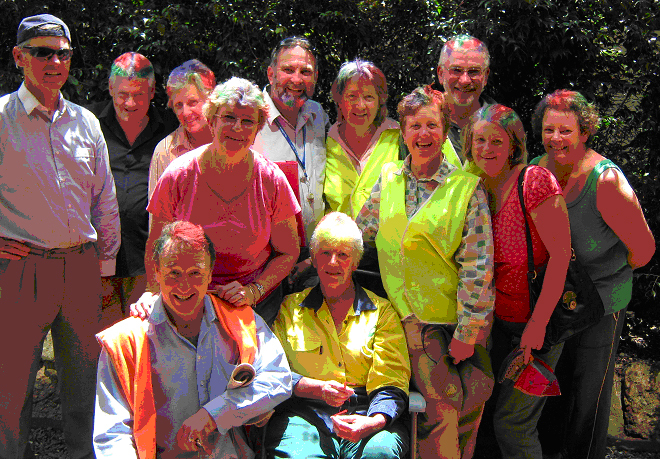 The group originally came together as the �Green Gym�, part of Australian Conservation Volunteers, under the expert guidance of Paul Price. 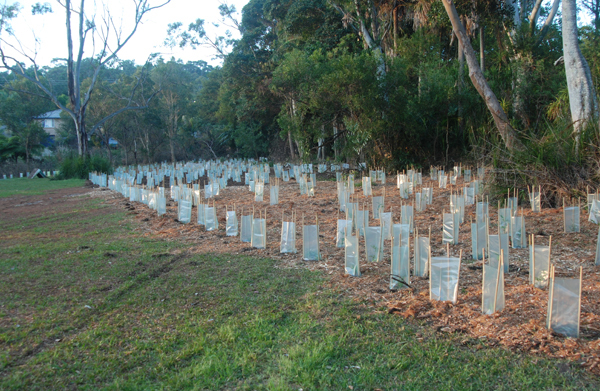 We worked on a number of bush regeneration projects in the Port Macquarie area so, with the demise of �Green Gym� it was a natural transition for us to join Landcare and continue the work we all enjoy. We thought that rainbow coloured hair was compulsory so we prepared properly to pick up our new uniforms from Estelle! It should grow out in a few months. The results of this research will hopefully be presented by Dr. Ross Peacock and Bill Chapman at next years Science Week talks at Sea Acres in August 2010. 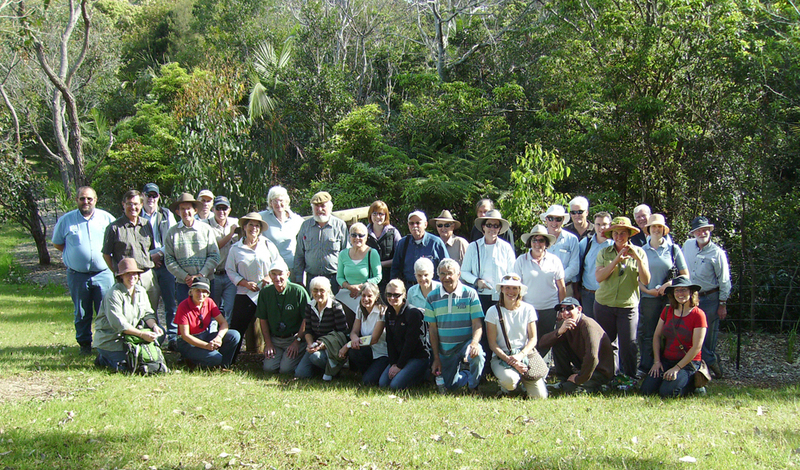 The 2009 Landcare Forum visits the Lilypond. The day was spent clearing out infestations of weeds, mulching, cleaning up the creek and planting approx 1000 native plants. Not forgetting the fabulous morning tea, lunch and afternoon tea. Many thanks should go to all those who contributed and Participated. (Left) 1000 Plants Planted, mulched and watered (Right) Rob Oakeshott gives a helping hand. Minister for Agriculture, Fisheries and Forestry, Tony Burke, spent a morning with Estelle Gough at the Landcare Nursery and Blair Reserve. During morning tea, representatives or NRCMA and Hastings Landcare where able to discuss local issues with the minister. 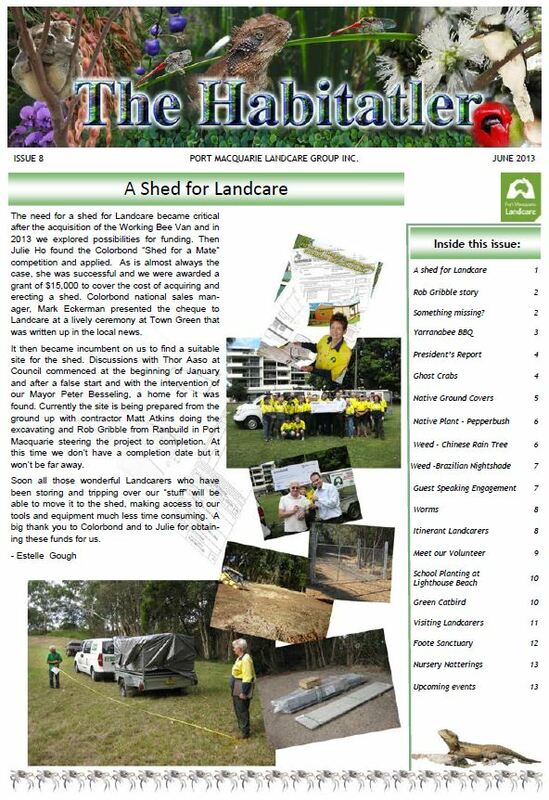 This site is a tribute to all the work done by the Landcare Volunteers.